Do you want to speak with us at DSS Europe 2018 ? Our Staff will be present at DSS Europe 2018 (Frankfurt), come and talk to us ! 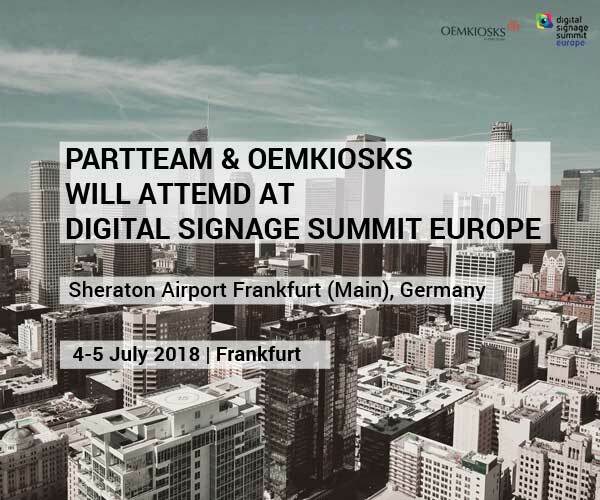 PARTTEAM & OEMKIOSKS is a worldwide reference in the development and manufacture of multimedia kiosks and digital billboards and will be present at DSS Europe- Digital Signage Summit Europe. DSS Europe 2018 will be held in Frankfurt on 4 and 5 July 2018. You can speak directly with the CEO and founder of the PARTTEAM & OEMKIOSKS company, with the Commercial Director / Sales or Technical Director.